Flesh Flies - Fly Angler's OnLine "Intermediate Fly Tying Part 49"
Flesh flies are standard patterns used most often by steelhead and pacific salmon folks. The idea is to make a fly that looks like a piece of flesh that has been ripped off of a salmon by a bear or other predator while the unlucky fish was trying to make its way to the spawning grounds. If you add some white, it might look like the decaying flesh of a salmon that finished the spawning task and expired as they always seem to do. Once expired, their bodies feed countless animals and birds. Some pretty large chunks of flesh always seem to get washed away to be picked up by other salmon or large trout. Bunny leeches are another type of flesh fly. 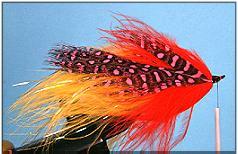 The steps and techniques are pretty much the same whether tying a bunny leech or a marabou flesh fly. Whether you're wrapping rabbit fur strips or marabou feathers around the hook, you still need to make sure you don't wrap over the fluffy stuff, and that the fly "breathes" right. 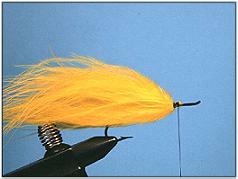 For those who wish to tie bunny leeches, use these techniques but change the materials to rabbit strips instead of marabou feathers. One thing I find funny about flesh flies is that northern pike living in lakes far from any salmon streams like to try to eat them. It seems these morsels look like food to more than one type of fish. Catfish will also grab one of these morsels if the opportunity is there. Folks living near hydroelectric dams might want to try these flies below the water discharge from the generator turbines. Trout and panfish often slip into the water intakes for the power plants and exit in bite sized chunks that big fish wait for downstream. Select colors that match the predominant colors of the flesh and skin of the most common fish in the lake. You'll be surprised by the variety of fish you can catch below a hydroelectric dam with this type of fly. The great thing about fishing the water discharge areas is that the biggest fish in the river seem to hold in those areas waiting for an easy meal. Flesh flies look like an easy meal. If you want to add weight, you can slip a bead or cone over the hook before you begin tying the fly, or you can wrap lead wire around the hook first. For a real heavy fly that keeps the hook pointing upward, try hourglass or barbell eyes for weight. 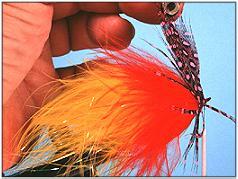 Bass fishermen should tie this fly in the colors of common baitfish in their area. The breathing action of the body is just the ticket to lure some big hog bass into a feeding mood. Who would complain about a thing like that? 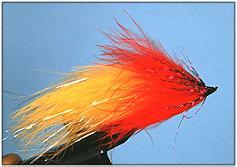 Hook: Classic salmon fly hook. Mustad 80500BL or equivalent. Sizes 2/0 to 6. Thread: Black or bright colored, 3/0. Flash: Flashabou, crystal flash or holographic flash added to attract attention. 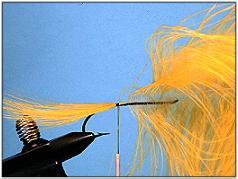 Hackle: Bright guinea feather or any other dyed feather that produces the right color and effect. 1. 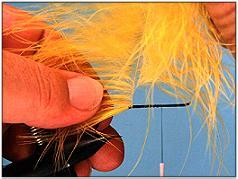 Stroke the fibers of a marabou feather against the grain of the feather to expose just the tip of the feather. Tie it to the hook at this point as shown. 2. Advance the thread to a point midway on the hook shank. 3. 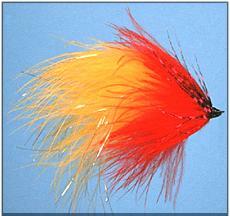 Start wrapping the marabou around the hook like a hackle. 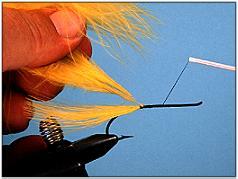 Pull the fibers back with one hand to prevent them from being bound down to the hook by the feather stem. 4. Continue wrapping the marabou feather forward until you've used the entire feather or the feather's stem gets too thick to wrap. 5. Tie the feather off and secure it to the hook with thread. 7. Trim the flashy material to the length of the tail. 8. Tie in a darker colored marabou feather the same way you did the first one. 9. 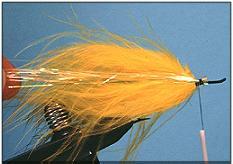 Using the same technique you used to wrap the back half of the fly, wrap this feather forward to just behind the hook eye. Leave a little room for a good head and one small hackle. 10. 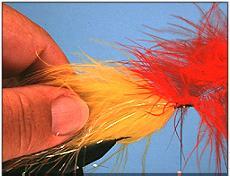 Select a darker (but still a bright color) guinea feather and tie it in as a hackle. You have a choice as to whether you wish to tie it in at the tip or the base of the feather. Since guinea feather fibers get shorter as you proceed toward the tip of the feather, I chose to tie it in by the base of the feather so all of the feather would be visible. 11. 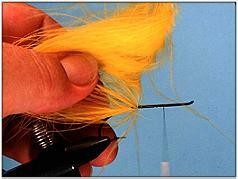 Wrap the feather forward with hackle pliers just like you'd wrap a wet fly hackle. When you've used up the entire feather, tie it off and trim the excess. 12. Build a smooth head, whip finish, trim the thread and cement the head. 13. 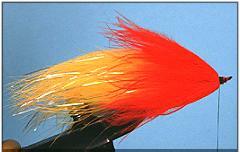 Your finished fly should look similar to this. Experiment with different colors to see what the fish are looking for. Try rabbit strips too. You might discover that this fly works in more places than the far north.